The 2018 Kia Sorento has it all: modern features, eye-catching exterior design, and a versatile interior. Whether you need an SUV for your family or for your individual needs, the Sorento is a must-see. Check out what the 2018 Kia Sorento has to offer by continuing on with this blog post. Kia upgraded the Sorento for 2018. New for the model year is a standard hands-free power liftgate, which makes it easy to load or unload the vehicle. There’s also power folding side mirrors and a Cool and Connected package, offering dual zone climate control, Apple CarPlay, and Android Auto. The base trim of the Kia Sorento features a 2.4-liter inline four engine under the hood. This engine earns 185 horsepower and 178-pound-feet of torque, which is plenty of power for your daily driving needs. 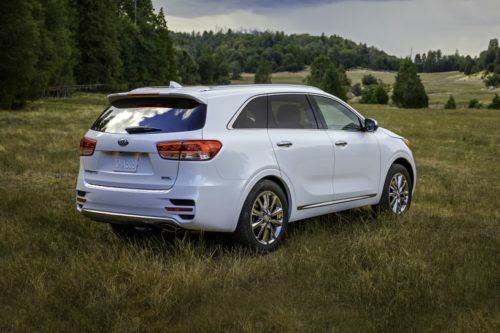 However, if you’re seeking more strength for the Sorento, opt for the 2.0 liter turbocharged inline four engine to receive 240 horsepower and 260-pound-feet of torque. The final engine option is an incredibly powerful 3.3 liter V6 engine, which can earn up to 290 horsepower and 252-pound-feet of torque. The 2018 Kia Sorento is a modern vehicle with the technology to prove it. Enjoy keyless entry, cruise control, Bluetooth connectivity, and stain resistant cloth upholstery with this SUV. There’s also a rearview camera that makes backing into or out of driveways and parking spots a breeze. Designed to meet your needs, the 2018 Kia Sorento is a stellar SUV. Come see this vehicle for yourself by making your way to Yonkers Automall. Our pre-owned vehicle dealership is located at 1716 Central Park Avenue in Yonkers, or you can contact us by phone at 855-700-9198 to learn more about the 2018 Sorento. We look forward to showing off this SUV to you soon!